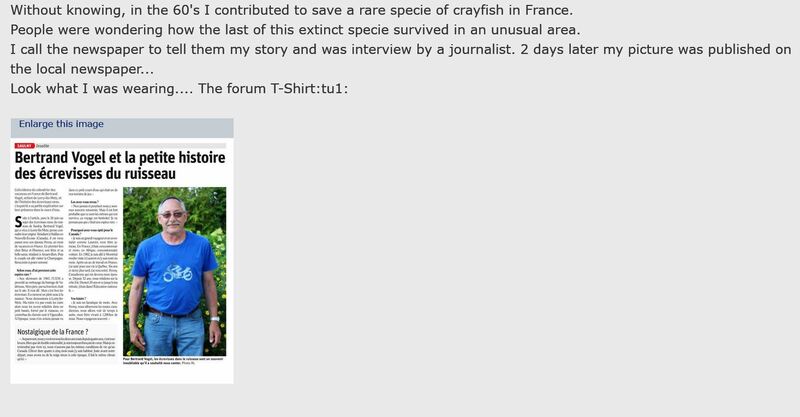 Without knowing, in the 60's I contributed to save a rare specie of crayfish in France. People were wondering how the last of this extinct specie survived in an unusual area. Okay Bert... translation? I got about a third of the way through before I had to give up because some of the words completely eluded me. I can't find the link in the post. @Point-Seven-five wrote: I can't find the link in the post. There is no link to the newspaper article. 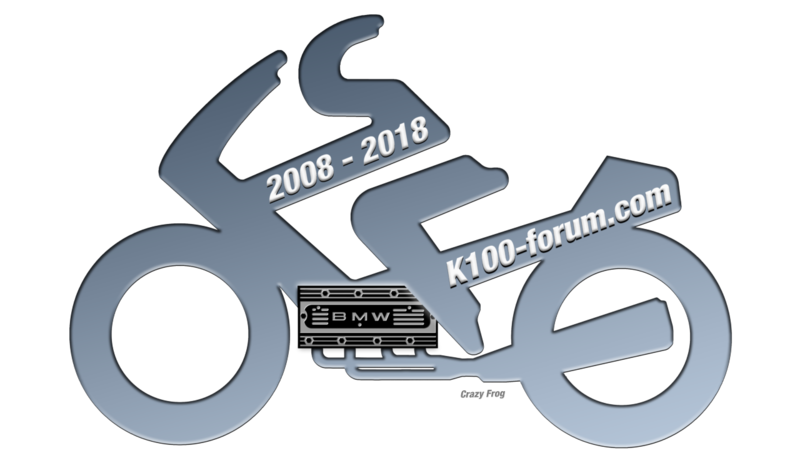 I received it by Email. Okay, how can I see the article and photo? Is there something wrong with my browser? @Point-Seven-five wrote: Okay, how can I see the article and photo? Is there something wrong with my browser? There must be something wrong with my browser. All I see is "Here is what you should see:" No picture. There are other threads here where pictures or attachments don't appear. It seems to be random as other pictures and attachments do appear. I have noticed that this has been happening lately on a couple other sites as well as this forum. It's been doing this for abut a month or more now. Browser is latest version of Firefox with all current updates. I am getting less and less computer proficient and have increasing trouble managing updates and stuff like anti-malware and popup blockers. @Dai wrote: Okay Bert... translation? I got about a third of the way through before I had to give up because some of the words completely eluded me. 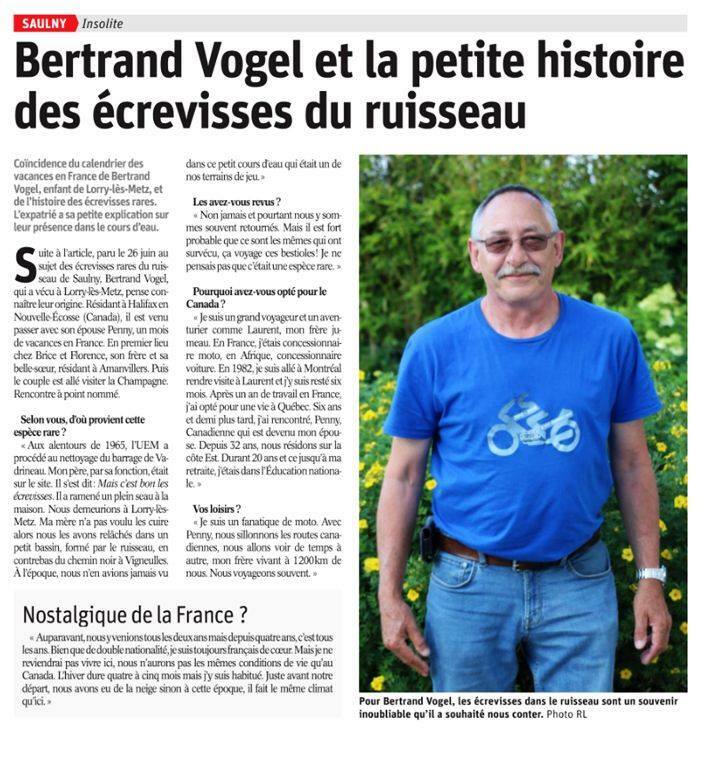 I think I got most of it...and "Je suis fanatique de moto" pretty much says it all about Bert! Nice article - good to see it wasn't all about Jacque Cousteau dominating the aqua environment in the 60's (but he does rate as one of my top 5 people who have made a big impression on my life).